The Computer Power Monitor Cord is the ideal simple and affordable solution for extending the length to your Desktop Computer, PC, Monitor, Printer, Scanner Etc with this 16Awg SJT NEMA 5-15P 3 grounded male plug on one end connecting into any grounded outlet power source and a IEC C13 3 conductor PC power connector socket on the other end connecting into your power device. The Maximm monitor cord is a 16-gauge consisting of three-prong, grounded for safety. Providing highest quality with a Sturdy Long-Lasting Construction, durable vinyl covering insulating and protecting the cord's conducting wires, plus resists moisture, abrasion, and the damaging effects of sunlight. This cord is recommended for general indoor use. 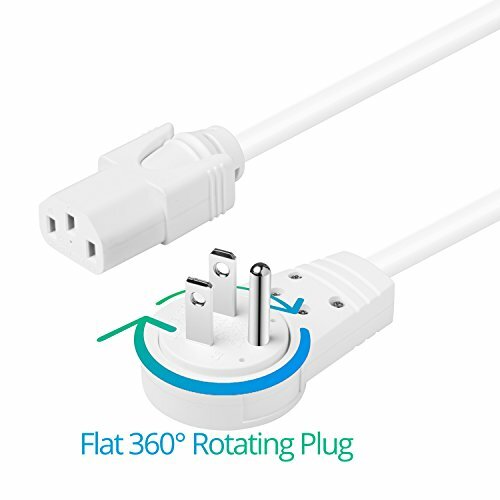 360° ROTATING PLUG: The Maximm universal power cord is top quality featuring a 360° degree rotating flat supply plug making it much easier to maneuver in any direction you wish.